Are you ready for one of today's top skin care products with alpha hydroxy acids? Welcome the new Avon Anew AHA Refining Cream. What is Avon Anew AHA Refining Cream? One of the top skincare staples today is alpha hydroxy acids. These AHAs are potent acids that can help skin look smoother and take years off your skin. Actually these acids are one of the most effective anti-aging ingredients today. The Anew AHA cream can be used every day since it has an exclusive blend of antioxidants and soothing agents. Why Use Anew AHA Cream? 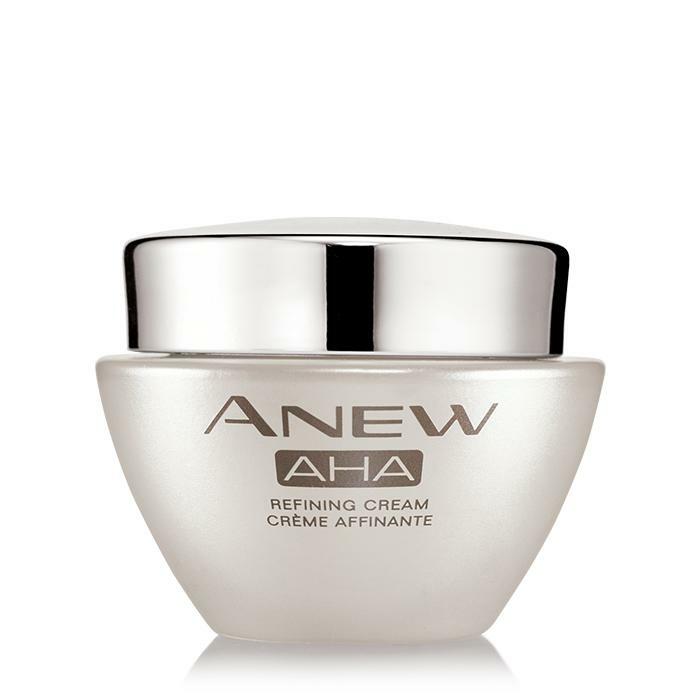 Anew AHA cream is so gentle it can be used every day. Do you really need this skincare product? The answer is Yes! This amazing product can help your skin look years younger. Read on to see all the benefits you can expect by using this product on a regular basis. Below I have listed the benefits by using Anew AHA daily. women tested showed improvement in general overall skin aging. Step 1 - Cleanse your face with an Avon skin care cleanser. Check out my blog post to find which one is perfect for your skin type. Step 2 - Exfoliate your skin with an Avon skin care exfoliator or the new Anew Clinical Extra Strength Retexturizing Peel. Step 3 - Moisturize your skin with the Avon AHA Refining Cream in the AM or another of the Avon skin care moisturizers. Smooth gently over your face in an upward and outward motion. If you feel a slight tingling sensation, wait 15 minutes after cleansing. You may also just use less of the cream until your skin adjusts. Step 4 - Apply an Avon eye cream. If you have bags under your eyes, read my post on the best Avon eye cream for puffiness. Here is a list of the ingredients in Anew AHA. At the time of this writing there are no Avon AHA product reviews. Check back for the most recent customer reviews. The regular price of Anew AHA is $30. It comes in a 1.7 oz jar. The introductory price in campaign 11 2016 is $19.99. Check now for the Avon Anew AHA sales price. Try this new Avon Alpha Hydroxy Acid Product by clicking the link below!